Every few months, Andrew Morrison gets a call about a pile of asbestos that’s been illegally dumped. Morrison, the owner of Andrew’s Asbestos Solutions in Victoria, Australia, says the cost of proper asbestos disposal sometimes makes people feel forced to find their own solution. But when it comes to asbestos, cutting corners can lead to harmful exposures and serious health risks, including mesothelioma and other cancers. “They’ll ring up wanting to do the right thing, but they can’t believe how much it costs,” he told the Sydney Morning Herald report. Much of Morrison’s business includes removing asbestos from old outbuildings present on most farms throughout the state and disposing of it safely. He says many farmers don’t call him, but they decide instead to bring the building down themselves and haul the asbestos waste somewhere out in the bush. According to an Australian federal government report, an estimated 44 pounds of asbestos-contaminated waste is generated for each person in the country annually. “Waste policy is driven by the requirements of most waste, but asbestos is a real exception,” report author Joe Pickin of consultant group Blue Environment said. The volume of asbestos waste the country will need to dispose of is expected to increase by about 2.8 percent annually over the next 20 years, yet there’s no effective plan in place to manage the growing burden. As the asbestos accumulates, landfills willing to accept the deadly waste are on the decline. The report warns of a national trend to replace landfills with transfer stations that are less likely to accept asbestos, which complicates the problem. Those that do accept asbestos hike the prices. “Fees for the disposal of asbestos are set by private landfill operators and when the costs are high, it leads to illegal dumping, asbestos being hidden in general waste or diversion to distant sites, increasing the risks,” Asbestos Safety and Eradication Agency chief executive Pete Tighe said. No wonder Australia faces this dilemma. The country ranked highest in asbestos use per capita from the 1950s to the 1970s, mainly because of asbestos demands for construction materials and textile mills. Now commensurate with that use, Australia ranks second in the world for deaths from mesothelioma, a fatal cancer caused by breathing asbestos fibers. Since the 1980s, more than 10,000 people in the nation died from the disease. The shrinking number of landfills in nearby New Zealand means waste with or without asbestos frequently travels across district lines. In the last 10 years, New Zealand’s landfills have declined from 300 to about 56 as a result of guideline changes. Currently, about 12,000 tons of asbestos-contaminated fill from Canterbury received approval for dumping in Dunedin. The deal reportedly numbered in the millions of dollars. In 2015, an effort to reduce waste disposal costs spawned rabid public debate in Guam. The Guam Environmental Protection Agency proposed to begin dumping asbestos in Layon Landfill, departing from the island’s decades-long ban on asbestos disposal. The current approach to asbestos disposal involves hauling an estimated 100 tons of contaminated fill each year across the ocean to approved disposal sites in Nevada and other locations on the U.S. mainland. According to Pacific Daily News, Guam could save 70 percent on disposal costs by disposing of asbestos on the island rather than shipping it off. Many elected officials spurned the idea, however, arguing the savings aren’t worth the danger asbestos poses to nearby residents. Layon landfill sits near the village of Inarajan, where Doris Lujan serves as mayor. She says she and her constituents would protest any plans to dump asbestos into the already problematic landfill, which continually emits foul odors in the Inarajan community. Protestors in Ireland flatly rejected an idea to dump asbestos in West Belfast in November 2015. The backlash came after quarry company Whitemountain filed an application to dump an expected 300 tons of asbestos per year in its Black Mountain Quarry site. Sinn Féin, Ireland’s Republican Party, organized the opposition, which according to The Irish News demanded the company withdraw its application. “People are very concerned with regards to all this toxic waste on their doorstep, and what if there is an accident when waste is going in or out?” Sinn Féin parliament member Paul Maskey said. A petition circulated with hundreds adding their name to the list while Whitemountain declined to comment. “The people who want to avoid regulation, they’re going to dump it wherever they can,” Jim Caya, general manager of the Canadian demolition firm Green Demo, said in a Global News report. WorkSafe BC in Vancouver, British Columbia, initiated a crackdown on renovation and demolition as a result of asbestos-contaminated wallboard, sheetrock and other contaminated products in older homes. “Asbestos disease is on the increase in this province. We have more workers today dying of asbestos-related disease than ever in the history of WorkSafe BC,” Al Johnson, vice president of prevention at WorksSafe BC, said. The increased stringency in regulation results in long lines at the dump to dispose of the toxic building materials, and according to Caya, also increases illegal dumping of asbestos-contaminated wallboard on municipal land and parks. “It’s a very serious issue; it’s not just the dumping of the materials. The issue is someone has ripped it out from somewhere where people have been contaminated,” Caya said. 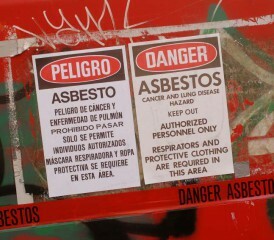 Around the world, asbestos disposal creates a dilemma for local, state and federal municipalities. As dumping sites decrease and regulation increases, the issue of where to put the harmful waste escalates. Morrison claims an asbestos disposal job that used to take him two hours now takes five or six because he has to travel a farther distance to dump the toxic materials. “To me, it makes my business fairly expensive and it just encourages people to do the wrong thing,” he said. Pickin admits Australia lacks an answer. “I don’t think you would say that there is a good strategic plan in any state or even nationally,” he concedes.